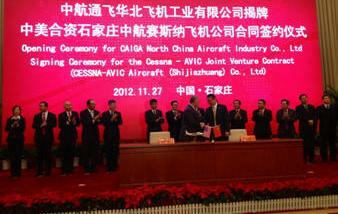 November 27, 2012 - Cessna Aircraft Company has entered into a joint venture contract with China Aviation Industry General Aircraft Company (CAIGA) in accordance with their previously announced strategic agreement, for the formation of a joint venture company to conduct final assembly of Cessna Caravan utility turboprop aircraft in China for the Chinese market. The joint venture contract also contemplates the possibility of designing and assembling new models of utility turboprop aircraft in the future. Formation of the joint venture company remains subject to various government approvals and customary conditions. Cessna's Wichita, Kansas operations will provide components and parts manufacturing and sub-assemblies for the Caravan aircraft to be sold by the joint venture. Joint venture operations in Shijiazhuang will be designed to conduct final assembly, paint, testing, interior installation, customization, flight testing and delivery of the Cessna Caravan to in-country customers. "Since its introduction, the Cessna Caravan has proven to be an incredibly reliable aircraft and is particularly well suited for growing global markets," said Scott Ernest, Cessna's president and CEO. "Cessna is pleased to bring the Caravan to customers in China who will benefit from its quality and versatility." Management of the joint venture will include board members from both Cessna and CAIGA, with the general manager to be nominated by Cessna Aircraft Company and the deputy general manager to be nominated by CAIGA. "Cessna continues to work closely with our partners at CAIGA to bring high quality aircraft to the Chinese market that meets customer expectations for reliability," said William Schultz, Cessna's senior vice president of Business Development, China. "As general aviation continues to grow in China, Cessna is committed to offering the right products to serve the market complemented by the company's unparalleled customer service." This joint venture contract stems from the strategic framework agreement that Cessna entered into with CAIGA parent company, Aviation Industry Corporation of China (AVIC), in March 2012. Cessna is the world's leading general aviation company. Since its inception in 1927, Cessna has designed, produced and delivered more than 193,500 airplanes around the globe. This includes more than 6,300 Citation business jets, making it the largest fleet of business jets in the world. Today, Cessna has two principal lines of business: aircraft sales and aftermarket services. Aircraft sales include Citation business jets, Caravan single-engine utility turboprops, single-engine piston aircraft and lift solutions by CitationAir. Aftermarket services include parts, maintenance, inspection and repair services. In 2011, Cessna delivered 689 aircraft, including 183 Citation business jets, and reported revenues of $2.990 billion.